OVERVIEW: This book is a great way to encourage perseverance and show children that it is ok to make mistakes! DESCRIPTION FROM THE PUBLISHER: Some kids are too smart for their own good…and maybe for everybody else’s good. When an overly ambitious little girl builds a humongous robot for her science fair, she fully expects to win first place. What she doesn’t expect is the chaos that follows. 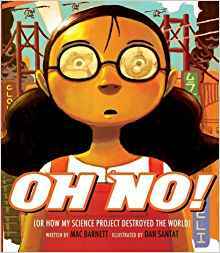 Mac Barnett, a new picture book author on the rise, and Dan Santat, illustrator of Rhea Perlman’s Otto Undercover series, combine forces to create a hilarious kid’s eye account of the kind of destruction that comes only from a child’s good intentions.